Does this make me a fashion blogger now? I hope not. Standing behind the camera has always been my comfortable area. I have recently felt too much like a 'Mom' when dressing myself in the mornings. I often go towards my standard high waisted jeans, a plain top and trainers but often found having a panic over what to wear when I'm asked to socialise or 'dress up'. 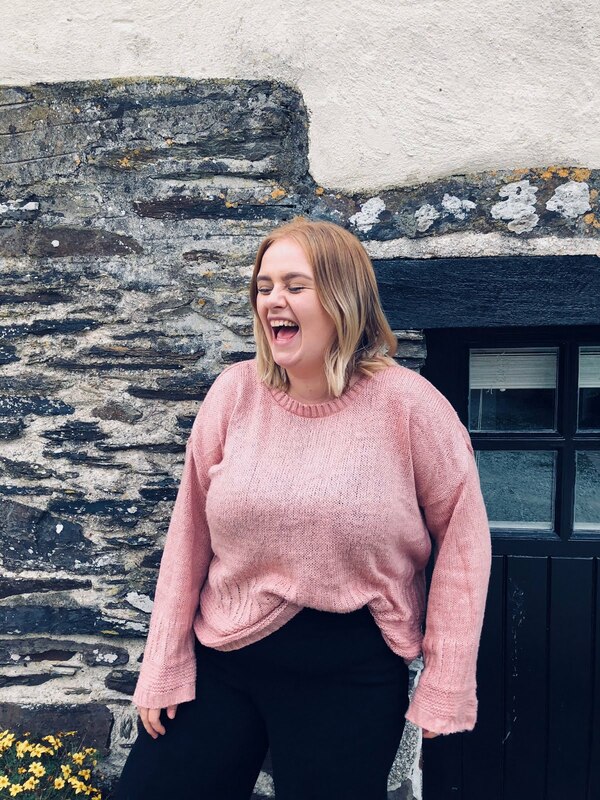 As I've mentioned anything that draws attention to my body has always been a huge no for me and especially now that I don't feel comfortable with my post baby body weight, meaning I have let my fashion go down the drain. For no reason other than Instagram I have found myself buying items of clothing that really push me out of my comfort and realised that certain items of clothing, although very out there, can actually make me feel glamorous without feeling like the whole world is staring at me. When I was younger I remember my Mom trying to buy me high waisted jeans and all I wanted to wear was mid or low rise jeans. Skip to 2019 and I'm cringing at the idea of chubby 13 year old me walking around with hip grabbing trousers. I wear nothing but high waisted these days. Mothers all around the world are probably thanking the gods for high waisted clothing. The midi skirt, the high waisted jeans and floaty pants that allow all the over-hanging baby bump belly to be tucked in. Allowing ourselves to be fooled for a few hours that it doesn't even exist. I have been loving the midi skirt, which I never though I would. Mainly because not only can it be high waisted and gives the illusion that your thighs aren't rubbing together but it can be up and down styled. Worn with trainers, sandals and heels. I love nothing more than an all season piece of clothing. High waisted jeans are a must have for a mom wardrobe. For obvious reasons, they're comfy and make you look like you semi have your life together when in public. For the spring and summer seasons I have stocked up on high waisted floaty trousers. These again are hella comfy, tuck everything in and allow for an all important breeze in the heat. At first I was a little wary of The Slogan Tee, mainly because I find the idea of someone in public trying to read my chest area a little off. But these are a must in your wardrobe this spring. 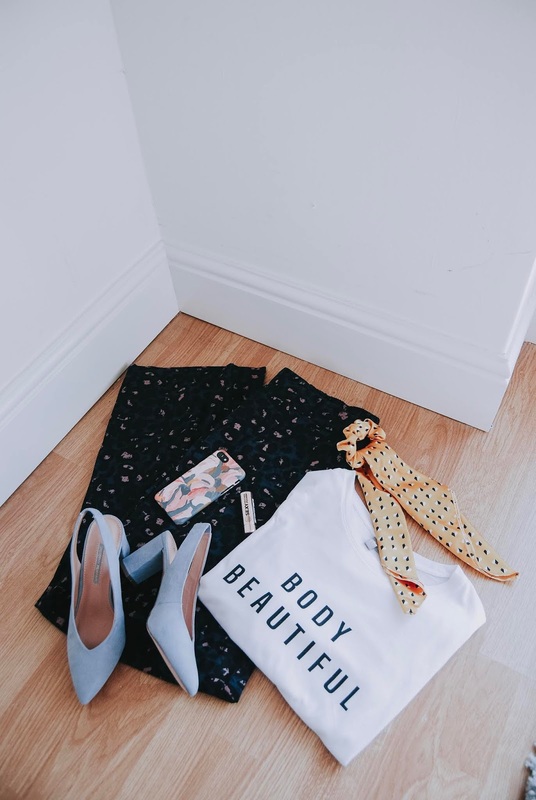 A slogan tee can be a great addition to your outfits this spring because they add a little sass to otherwise boring outfits and can be paired with pretty much anything for any occasion. Perfect if you're a very indecisive dresser like myself. The Plain Tee again is great because they go with your patterned skirts and shorts, plus keep your outfits a little simple. I pretty much pick one out any time I'm going out with Ru because there is a huge chance of snot or sick being applied to my outfit. I always buy mine in the size up so they can be tucked in or left hanging and give absolutely no indication of how chubby I've become. The Headband has recently come back into fashion and I'm so here for it. Kind of wishing my black velvet headband with my name written in glitter gel pen was still around, but hey ho. Bright, Patterned and Floaty hair accessories are the perfect addition to my mom wardrobe. But why? Anything to distract from the fact I couldn't put a 'fashion' outfit together or that I have a stain on my top, is PERFECT. I find that on days where I have to go out but don't have time to do anything spectacular to my look I put on my standard jeans, slogan tee, trainers and a headband. I automatically look like I've put a little effort in. You can buy these headbands from pretty much everywhere too. One thing I've learnt being a Mom is that comfortable footwear is very important. There has been many occasions where I have been pushing round a pram with pinching trainers or rubbing boots. It's not pretty and It's not nice. I rely heavily on My White Converse, My Midi Heels and My Slippers. Anything else is for when I'm 'off duty'. The White Trainer is so diverse these days. I wear mine with practically every outfit: Midi Dresses, Jeans and Leggings etc. Plus they provide optimum comfort for when you're out and about. Another fashion statement that I was late to the party with was the Midi. I never thought it would be a staple item in my wardrobe, mainly because I thought it was a little too out there for me. The Midi Dress or Skirt is an item that can be dressed down for days out or dressed up for occasions. Plus it can be worn with trainers making it that much more fun. My Midi's hide the areas I don't like and allow me to be comfortable in my outfit without feeling like everything is being squeezed out of me. I also feel like a stylish Mom when I wear it, which is always a bonus. So what are your fashion faves going into spring? I’m obsessed with my white converse these days and really want to invest in the midi skirt trend! It’s so cute and flattering for all body types! I love a good slogan tee and I have been loving hair accessories at the moment too. Primark do some really amazing headbands! I’m obsessed with high waisted items and midi skirts. I’m very much part of the “thunder thighs” club and midi skirts really help to hide it!